The Federal Reserve has planned 8 rate hikes over 2018-2019, and a world with "Quantitative Tightening" has forced fixed income investors to re-consider their liquidity strategies. Lower volatility and borrowing rates from the US may portend global markets to follow. This has huge implications for Fixed Income markets. 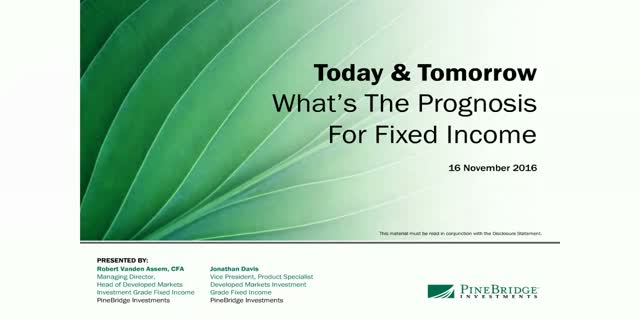 - How can Fixed Income investors adapt to a new world of rising interest rates and mediocre liquidity environment? - What other global macro events may happen that will affect fixed income investors’ portfolio? - Will developments in electronic trading platforms help fixed income liquidity? Chief Economist Markus Schomer discusses why global trade and growth are still accelerating in spite of trade war threats. Anik Sen, global head of equities, on why earnings growth will drive wider dispersion among stocks in a more fundamentally driven market. Laila Kollmorgen, CLO Tranche portfolio manager, explores our in-depth credit analysis and due diligence, as well as experience both issuing and managing CLOs. We are seeing a new, more meaningful driver of shareholder value take over. The stock market is now rewarding companies that are making strategic investments in their businesses rather than focusing on self-preservation, as most did in the years following the crisis. Identifying winning companies can be difficult in today’s markets as many investors are buying benchmarks, causing crowding and a “fat and flat” distribution within the equity market. So how does an investor break away from the herd? Anik Sen, PineBridge’s Global Head of Equities, will share his differentiated process for picking the right stocks in today’s market – an approach much different than the top-down, style-based investing that has characterized investment flows for some time. We believe 2017 will be the year where growth cycles reconnect and become more synchronized. Almost halfway through the year, we have seen some surprises in global markets and economies. Political risk in Europe – what seemed to be the biggest threat to global growth – has largely been defanged. But political risk in the US and Latin America is gaining strength. Ongoing volatility continues to reveal compelling investment opportunities in Asian equities, as valuations look more attractive, China’s growth rate stabilises and domestic consumption soars. The PineBridge Asia Equity team follow a pure bottom-up approach that seeks under-valued, globally competitive companies with significant growth potential. This time-tested approach has stood the 18-strong investment team in good stead during times of volatility. Please join our team to hear their thoughts on the current outlook, potential bumps in the road and where they are finding growth opportunities for the rest of 2016 and beyond. During 2013, free from the market noise of the first taper tantrum, our Emerging Market Fixed Income Team stepped back and imagined what emerging market (EM) debt would look like in 2020. Quite a time horizon in the new world order where the unthinkable could be considered as a plausible scenario and spreads are often driven by sentiment and fears rather than fundamentals. Emerging Markets are a significant driver of global economic growth and highly idiosyncratic. With some US$15trn outstanding, emerging market debt could provide a huge opportunity, offering investors the ability to access government bonds or credit via local currency or dollar-denominated. Please join Steve Cook, Managing Director, Co-Head of EM Fixed Income and Natasha Smirnova, Senior Vice President, Product Specialist, who will share with you their current thoughts on the macroeconomic environment and how this will potentially impact bond investors. The Global Multi-Asset Team believes that markets will continue to deliver low returns and high volatility across many asset classes. The days of risk assets both producing high return and low risk are numbered. Global markets are now locked into a scenario that is comparable to riding a bicycle. Similar to a bicycle, a minimum speed for global growth is crucial to avoid unnecessary risk. Challenges for investors to deliver total return outcomes are here to stay. As a potent solution to deliver returns in this uncertain environment, the team believes that a more selective approach to today’s narrower list of attractive assets can help. Please join Michael Kelly, Global Head of Multi-Asset and Hani Redha, Senior Vice President, Portfolio Manager, to hear their thoughts on the current outlook and how future return potential is increasingly dispersed across asset classes, regions and sectors. PineBridge Investments is a private, global asset manager focused on active, high-conviction investing. We draw on the collective power of our experts in each discipline, market, and region of the world through an open culture of collaboration designed to identify the best ideas. Our mission is to exceed clients’ expectations on every level, every day. As of 31 December 2017, the firm managed US$85.3 billion across global asset classes for sophisticated investors around the world.